There was a moment in last night’s SOTU speech that demonstrated the bond between the President and Vice President that Martin wrote about yesterday. 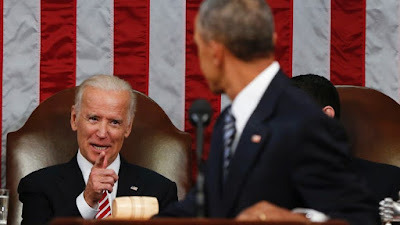 Last year, Vice President Biden said that with a new moonshot, America can cure cancer. Last month, he worked with this Congress to give scientists at the National Institutes of Health the strongest resources they’ve had in over a decade. Tonight, I’m announcing a new national effort to get it done. And because he’s gone to the mat for all of us, on so many issues over the past forty years, I’m putting Joe in charge of Mission Control. For the loved ones we’ve all lost, for the family we can still save, let’s make America the country that cures cancer once and for all. 1.) Increase resources – both private and public – to fight cancer. And it inspired a generation of Americans – my generation – in pursuit of science and innovation, where they literally pushed the boundaries of what was possible. It takes a certain amount of courage to shoot for the moon. The naysayers could have a field day with that one. But I’d challenge you to find a Trump, Cruz, Clinton or Sanders supporter who hasn’t been touched by the pain of a cancer diagnosis – either themselves or someone they love. If there is a mission every American should be able to rally around, it is this one. And who knows that better than Vice President Biden after the very recent death of his son Beau to this disease?